KALAMAZOO, MI, October 11, 2018 — The Kalamazoo Symphony Orchestra will present “Star Wars: The Empire Strikes Back,” on October 11 and 12, with Oscar-winning composer John Williams' musical scores performed live to the full-length feature film. 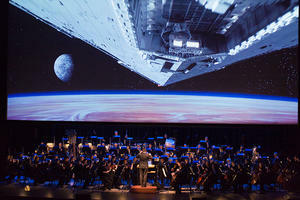 Fans will experience the scope and grandeur of this beloved “Star Wars” film in a live, symphonic concert experience. These performances continue the KSO's three-year deal with Disney®, announced March 2017, and feature the orchestra under the direction of Resident Conductor, Daniel Brier. Both concerts are at Miller Auditorium, and tickets are available through the Miller Auditorium Ticket Office, or at kalamazoosymphony.com. Attendees are encouraged to dress in Star Wars attire and to arrive early. Local Star Wars groups and costuming organizations will be available for photos and conversation beginning at 7 p.m. The concert begins at 8 p.m. Miller Auditorium's third floor balcony has been opened for both performances and offers additional $25 seating options for patrons. Tickets may be purchased online at KalamazooSymphony.com, or by calling the Miller Auditorium Ticket Office at 269.387.2300. Founded in 1921, the KSO (kalamazoosymphony.com) is Southwest Michigan's premiere musical organization and the state's third largest orchestra. Serving Michigan's fourth largest metropolitan area, the KSO provides more than 30 concert performances each year, reaching more than 80,000 adults and youth annually with exceptional symphonic music and world-class guest artists. With an equally vibrant educational mission, the KSO offers school-based programs that music teachers rely on to support their curriculum and after-school programs that have been recognized by the National Arts and Humanities Youth Program Awards and Carnegie Hall's Weill Music Institute. The KSO has won numerous awards and grants, including the Met Life Award for Arts Access in Underserved Communities, the National Endowment for the Arts for its extensive education programs, and a major Ford Foundation grant to establish its innovative Artists in Residence program. Disney Concerts is the concert production and licensing division of Disney Music Group, the music arm of The Walt Disney Company. Disney Concerts produces concerts and tours, and licenses Disney music and visual content to symphony orchestras and presenters on a worldwide basis. Disney Concerts' concert packages include a variety of formats, such as “live to picture” film concerts and themed instrumental and vocal compilation concerts, and range from instrumental-only symphonic performances to multimedia productions featuring live vocalists and choir. Numerous new concert packages and touring productions from Disney's portfolio of studios, including Disney's feature animation and live action studios, Pixar, Lucasfilm, and Marvel, are currently in development.